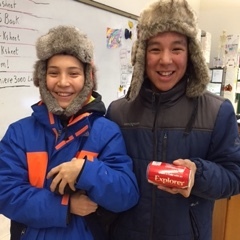 "The Salmon in the Classroom project is a youth development program that utilizes natural resource management issues to enhance the math and science literacy of rural youth, prepares them for post high school education, prepares them for a role in managing their local resource and empowers them to make a difference in their community. This 4-H Natural Resource and Youth Development Program is an integral part of our statewide delivery as a school enrichment program through Cooperative Extension's 4-H Program. 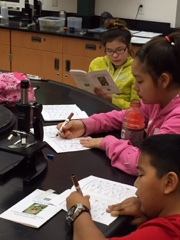 Our early partnership with the Alaska Native Knowledge Network (ANKN) and Alaska Rural Systemic Initiative (ADRSI) emphasizing place-based education and culturally responsive teaching methods added tremendously to our program. Blending western science and traditional ecological knowledge created an important bridge and distinction to our program. We went beyond just raising salmon in a tank to recognizing the deeper cultural, social and economic values and interrelationships associated with a subsistence lifestyle. This further increased our credibility and value to rural educators, students and communities." This blog post will be ongoing over the weeks and months as we follow the developing saga of our Coho salmon eggs. I will add pictures and comments when something notable happens. So check back occasionally to see what's going on! 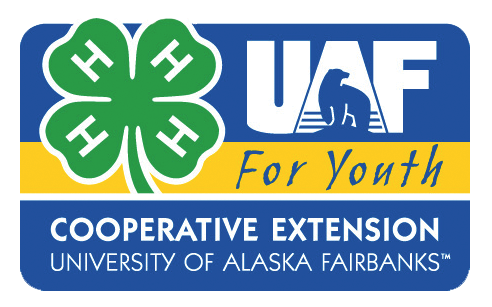 Salmon in the Classroom is an educational program supported through UAF Cooperative Extension Service 4-H and the Alaska Department of Fish and Game. Raising salmon in the classroom setting teaches students about salmon development and fosters students' appreciation of the need to protect salmon and their habitat. Plus it's FUN! I first heard about Salmon in the Classroom from Missy, my principal. She is the former high school science teacher and she put me in touch with the right people to get the ball rolling. There are applications, fees, equipment and permits to be secured before getting the eggs. Kay Shoemaker, an assistant professor at University of Alaska Fairbanks is the person who over sees the Program. Kay came out to Scammon Bay for a few days to introduce our students to the Salmon in the Classroom program and help us set up everything. 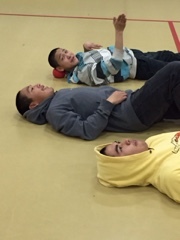 First, we played the Salmon Game. A fun, active way to learn about the life cycle of salmon. Some students were predators like sharks and eagles. Some students were the salmon trying to move through the obstacles. As you can tell it was an exhausting game! And we learned a lot about the perils of being a salmon. Only one salmon egg in a thousand will survive to return to it's stream and spawn. Next, Kay and Allie bravely collected some cobblestones from the bottom of our very cold mountain stream. 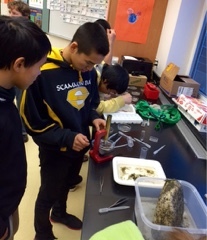 Our students examined the water for macro invertebrates that indicate a healthy stream. We learned about the "superheroes" of healthy water such as the caddisfly, mayfly, and stonefly. 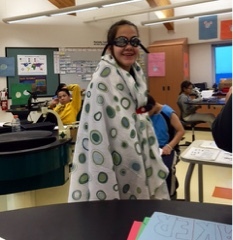 Adam-girl is our Caddisfly "superhero" with eyes that can see underwater and a camo cover for a home. Many students learned to identify several different macro invertebrates in our stream. Then Kay supervised my students as they set up the aquarium in preparation for the arrival of our Coho (Silver) salmon eggs. Great teamwork! The completed setup has insulation all around the outside, a UV light to kill bacteria, a big filter, and a programmable chiller. Salmon eggs need cold, oxygen-rich water and limited exposure to light in order to develop properly. We used water from our mountain stream. The chiller maintains the temperature at 6C which is about 43F. So the kids had the aquarium nursery set up, ready and waiting for our eggs to be flown in from the hatchery in Anchorage! Our eggs were scheduled to arrive on Dec. 1st but the weather prevented flights into Scammon Bay. Our lovingly packed but sensitive salmon eggs had to wait the night in Bethel airport. We worried a little bit. The morning of Dec. 2nd on the 10 am flight sat our very special cargo! 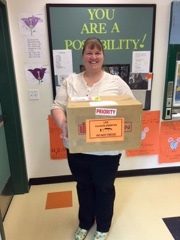 Missy, our courier (otherwise known as our Principal), hurried to the airstrip to collect the box of eggs. Below you can see the process of unpacking the eggs and putting them in the tank. The school was abuzz with excitement! My students were gentle and oh so careful. We found about 200 living eyed eggs wrapped in muslin and burlap inside the insulated box. Below you can see a diagram of the eyed-egg stage. We could actually see their eyes and they were moving around. They came in at 355 ATUs-Accumulated Thermal Units. 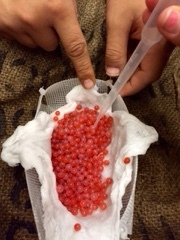 The hatching ATUs for Coho are between 400-500. ATUs are calculated by keeping a running total of the daily water temperature. 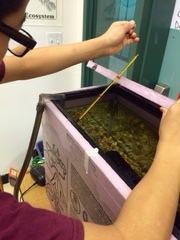 Floating the eggs to acclimate them to the water before sinking them to bottom. Below are 2 dead ones. Opaque or white eggs are dead and must be removed from the water. We've only lost 4 so far! We know that some will die due to stress of transport and overcrowding. 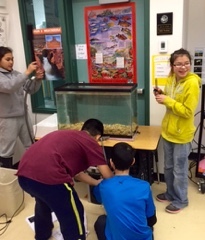 Students have signed up for different jobs in taking care of the salmon. 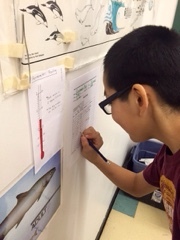 Below, Saund is reading the thermometer and calculating ATUs. 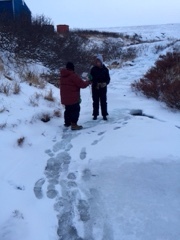 These 2 guys, Jr. and Adam, packed fresh water from the mountain stream! I really proud of my students and how they've embraced this project with a sense of responsibility and eagerness to learn more about the fish upon which so many of us depend. They reached hatching ATUs 2 days ago! So we are eagerly waiting! 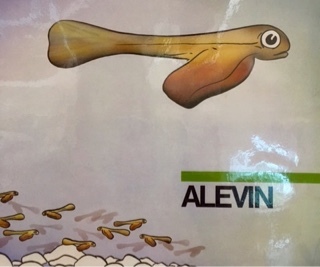 The next stage is called Alevin. More on that in a few days--hopefully! Today is December 17, 2015. 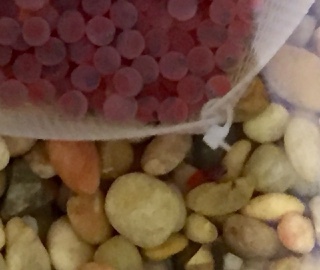 Fifteen days after their arrival into our classrroom we have salmon eggs hatching. Excitement abounds in our school! What a wonderful thing to witness! Kids have been peering into the aquarium all day long. We only have a few alevin so far! This morning we saw one. But he hasn't moved all day so we fear he didn't survive. As the day progressed my students spotted about 3 more. Alevin do not swim. They hide in the gravel while they continue to develop gills. Alevin do not eat. The yolk sac provides proteins, fats, salts and other nutrients. It is slowly absorbed over the course of 30-50 days. Alevin still need cold, dark, oxygen-rich flowing waters. If you zoom in on the photos below, try to find the alevin. They are a slightly darker color than the eggs. Can you find the alevin hiding in the rocks? Thank you Mary Cook and scammon Bay for sharing your story!